This is a (virtually) math-free introduction to microwave amplifiers from an applications standpoint. There are many references available for the aspiring amplifier designer; this series of posts will attempt to quickly elucidate the relevant factors for the RF system design engineer working to evaluate the appropriate amplifier for her system design. There are many ways to classify microwave amplifiers, but we will group them into four categories based on what role they would play in a generic superheterodyne receiver (shown above). The above system could represent a cellular, backhaul, satellite, or other radio communications link; it could also represent a radar or other imaging system. The transmitter alone could represent a jammer or exciter, and the receiver alone could represent an electronic warfare scanner or a test instrument. The requirements that drive the amplifier selection will be the same for most applications. The low noise amplifier is the most straightforward microwave amplifier to understand due the relative insignificance of nonlinear effects in the amplifier due to the low input power. It is designed to take a very low level signal such as you would see at the end of a lossy transmission medium and amplify it with minimal additive noise. It is critical to note that the noise is amplified with the same gain as the signal, in addition to the additive noise. This means that a low noise amplifier or any other amplifier cannot increase the signal to noise ratio (SNR), it can only raise the power level of both the signal and the noise. If the gain is narrowband, the amplifier may filter some out of band noise or signals, but it cannot improve the signal to noise ratio due to the in-band noise. If the SNR is not improved, then why bother amplifying? The reason is that successive stages in the receiver have loss, and that loss is also equally applied to the signal and noise. A loss will not significantly degrade the SNR of the signal if the noise level is already well above the noise floor. Therefore, the LNA noise figure typically dominates the noise figure for the entire receiver chain. Finally, the signal detector at the end of the signal chain (typically an analog to digital converter (ADC) in modern systems) has a detectable voltage range, and the receiver designer will use the amplifier stages throughout the receiver chain to match the received signal power to the detectable voltage range of the ADC. Low noise amplifiers are typically narrowband, or at least band limited, devices. This is because, as we will see in a future blog post about amplifier circuits, tradeoffs must be made to reduce the noise figure of the amplifier. Typically this means creating a narrowband matching network that optimizes the noise figure of the transistor in the amplifier. Modern LNAs can achieve extremely high gains with low noise figures, as much as 40 dB of gain with less than 1 dB of noise figure at low frequencies. The power amplifier is the opposite of the low noise amplifier. A power amplifier takes a signal that is already at a relatively high level and boosts it for transmission over a lossy medium such as through the air. While the gain of a PA is typically low (less than 10 dB), the power is significant in absolute terms (i.e. an input of 500 milliwatts could be boosted to several watts). The saturated output power (Psat) of the PA largely determines the physical range in terms of achievable transmission/detection distance of the wireless system. Saturated output power is obviously the most important parameter of a power amplifier, and efficiency is very closely related. Efficiency determines battery life for portable applications, transmission power for airborne/satellite applications, and heat dissipation requirements for all applications. Most of the power in many transceivers is used in the final power amplifier. Since both the signal and the noise output from the PA will be heavily attenuated by the transmission medium, the noise figure is not critical. Older frequency/phase only transmission formats like frequency modulation (FM), frequency shift keying (FSK), binary phase shift keying (BPSK) and others used signals with constant amplitudes, meaning that power amplifier nonlinearity was not a factor in signal quality. This was necessary since the tube amplifiers of the time had strong nonlinearities. Modern communication formats such as Quadrature Amplitude Modulaton (QAM), Orthogonal Frequency Division Multiplexing (OFDM), Code Division Multiple Access (CDMA), and most others use both amplitude and phase modulation and therefore require linear amplification. Many applications also require simultaneous amplification of multiple unrelated channels. This nonlinear behavior of the amplifier is described in many ways, and ultimately manifests as both degraded signal quality and legally restricted signal leakage into adjacent channels, as described by the Adjacent Channel Power Ratio (ACPR). These effects are often exacerbated by demands that the amplifier simultaneously amplify signals with large, unpredictable peaks in power. This signal characteristic is described by the signal peak to average power ratio (PAPR), and modern signals have much higher PAPR than their predecessors. By constantly demanding more information be transmitted in the same limited bandwidth, the cellular/wireless revolution has required linear amplification of high PAPR signals without leakage into adjacent channels and without draining the battery or creating too much heat. The billions of dollars that chased this demand led to an explosion of research and innovation in power amplifier circuits that we will briefly review in a later post. Linear signal amplifiers are generic amplifiers, sometimes called ‘gain blocks’, that provide signal gain within a system. Since they are not at the input or the output of the system, they are generally not the determining factor in the dynamic range of the system. Power levels are higher than into the LNA, but lower than the PA, and as such the choice of amplifier is a balance of linearity, noise figure, and what we will call ‘convenience factors’ such as cost, size, and power consumption. While the requirements placed on them are not extreme, they must not degrade the signal in any significant way. These amplifiers are never the star of the system, but the team still loses if they don’t do their job. The driver amplifier is the underserved application space that Marki specializes in. These amplifiers are specifically used for single frequency (continuous wave or CW) operation as in synthesizers or as amplifiers for the local oscillator (LO) driving a mixer. In consumer applications the role of the driver amplifier is typically integrated into the transceiver chip as a CMOS circuit. In high end electronic warfare, instrumentation, and test and measurement applications, however, these amplifiers are discrete to provide maximum system performance. Since these amplifiers are specifically used for amplifying a CW signal, the nonlinearity of the amplifier in terms of multitone intermodulation is not relevant; multitone inputs are assumed not to be present. Instead the important manifestation of nonlinearity is harmonic generation. In some applications harmonics are critical to reduce or filter before using the amplifier to drive a mixer because they can degrade the spurious performance of the mixer. In other circumstances (as with the T3), the harmonics actually improve the spurious performance. This will be covered in depth in a future post. In general a driver amplifier with less than an octave of bandwidth can be run near Psat if the harmonics are filtered since all distortion products will be at 2f or higher frequencies. As with multitone intermodulation, the noise figure of a driver amplifier is not critical as long as the noise of the signal source is not too high and the noise rejection of the subsequent circuitry (such as the LO-IF or LO-RF isolation of a mixer) is high enough that it eliminates the amplitude noise. In contrast to the amplitude noise, any phase noise added to the signal (or amplitude noise to phase noise conversion that occurs) in the amplifier will directly degrade the signal integrity of either radar signals or phase controlled communications signals. This can be a serious problem for modern dense constellation QAM signals in particular. Similar to harmonic content, the phase noise of commercial amplifiers is almost never specified. Since these amplifiers are required to generate LO signals that are always at least 6-10 dB higher power than the signal itself, they are required to be higher power amplifiers than the linear signal amplifiers in the system. Similarly, since there are several of these amplifiers in a superheterodyne system, especially a multi-channel superheterodyne system, they can be the largest consumer of power in a receiver. 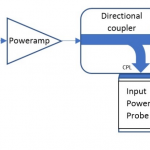 Therefore efficiency is very important for driver amplifiers. In future posts we will look at driver amplifiers much more closely, but first we have to discuss what each of the figures of merit we have mentioned in this post mean, which we will accomplish in Part 2 of the Introduction to Microwave Amplifiers.